Continuing our exploration into iphone and android mobile apps and live music, I wanted to share with you some of the experiments I’ve been doing on my Droid with one of Layar’s augmented reality apps. Now, let’s see how you can use Layar’s Tweeps Around 3D to enhance your next concert experience. Well, for starters, as we’ve discovered in previous Live Fix Experiments, during my two experiments with Tweeps Around 3D I’ve realized that in the history of concertgoing live music fans have never had more ways to connect with each other during the live concert experience. And with the development of mobile and Augmented Reality, I’ve been super curious to discover ways that these emerging technologies can also be useful and create meaningful connections for concerts fans. And so far I’ve discovered that the virtual connecting of fans with the Tweeps Around 3D mobile app is definitely high on the cool scale, but more importantly, it has the potential to be more than just simply a slick mobile augmented reality app to play around with. In this review, I’ll share with you a few screen shots I took with my Motorola Droid while I experimented this summer with Layar’s Tweeps Around at Pitchfork Music Festival and Perez Hilton’s One Night In Chicago Pre-Lollapalooza bash. And I’ll explain how I’ve been able to virtually connect concert fans who were enjoying different concerts in different locations. On one level, for me, this was a positive forward leap in our augmented reality mobile experiments. It sort of felt like what Big Live is doing by using social media to connect concert fans virtually through shared concert experiences online in real-time. But, in some ways my Layar experiment was a bit different that what Big Live does for fans, because I was actually at the concert event with others fans while other fans where at home watching another concert online and tweeting about it via Twitter. Though most of the AR “concert” apps that Layar has developed are designed to help fans find and locate various things at shows — like this Signet app that was recently used during Vodafone’s Sziget Music Festival — I’ve actually been more interested in discovering ways to use the AR apps to help connect fans connect at a show, or show how different types of concert fans are connected during concerts no matter where the shows are taking place. Yes, I think AR has a long way to go to where it is truly useful in everyday life or for concerts. But after these two experiments, augmented reality certainly seems to be moving forward and it can be used at least as a great experimental and sociological new media tool. And it’s a tool that I believe has potential to enhance our connect experiences by bringing the community of concert fans closer together so we can share our experiences as they happen in real-time. But again, my biggest challenge beyond the coolness test — like Foursquare — has been to find applications that are both useful and helpful for people — and my main goal is to find reasons why concert fans would want to use it. 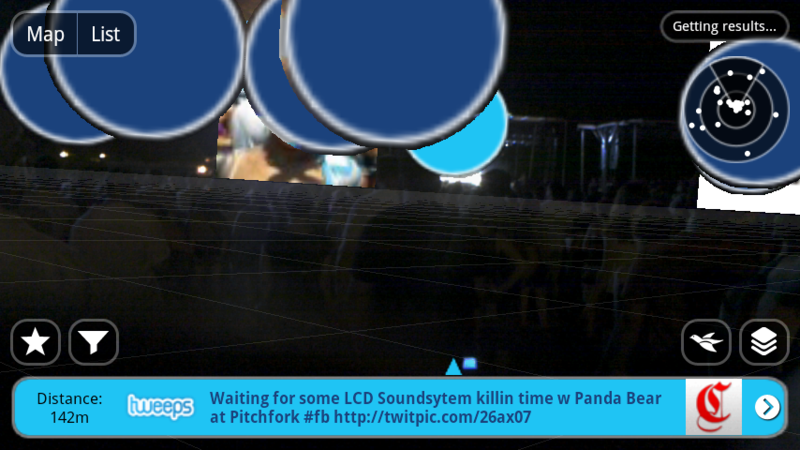 The screen shot above shows you what it looked like as I used the 3D Tweeps Around Layar app during LCD Sound System’s show at Pitchfork Music Festival in July. First, I downloaded the Layar mobile app from the Android Market. Then I selected the Tweeps Around Layar 3D app — which shows 3D real-time images of people who are tweeting (there at the concert with their mobile phone or at home on their computer) within a selected mile or kilometer radius. Next, I set the radius at 5 miles and I held up my Droid as if I was taking a picture and gradually the app gathers the search results (see the circle radar in the upper right hand corner). And as I moved my Droid around the 3D images of the people avatars, or the big blue and green bubbles, pop up showing me who’s tweeting. Then along the bottom of the screen the person’s tweet shows up. You can click on the tweet, read it and then respond directly to them in real-time. And like I said, beyond the coolness of the app, the usefulness for me was that I had the pleasure of seeing what other concert fans fetl and were experiencing as they tweeting their hearts out all around me. And it was fantastic because I could see not only the fan experiences from just a few feet away, but I could also discover the experiences of those fans who were tweeting, dancing and grooving the swarm at the front of the stage. But what I loved the most about using Layar at Pitchfork was having the chance to connect my LCD Sound System experience with another fan’s Tom Petty experience. Yep. That’s right. Petty and Pitchfork became one right on my Droid. Since Pitchfork was being held at Union Park — which is just a few blocks away from the United Center where Tom Petty and the Heartbreakers were wooing fans during the current MOJO tour — I was able to merge the fan experiences of an indie-rock concert with the fan experiences of a classic rock concert as they were happening live in real-time. Well, as I explained before, I held my Droid up and as I turned around I pointed my Droid towards the United Center and up popped a tweet from inside the United Center. And since the Tweeps Around 3D app lets you respond directly to the tweets that pop up on the screen, I quickly sent a tweet to the fan and we shared our experiences as if we were in the same venue. So just like that, a Tom Petty concert experience was merged with a LCD Sound System concert experience! And more importantly, two concert fans were able to connect, share and learn from each others concert experience, where in the past we weren’t able to do such a thing before in this way. 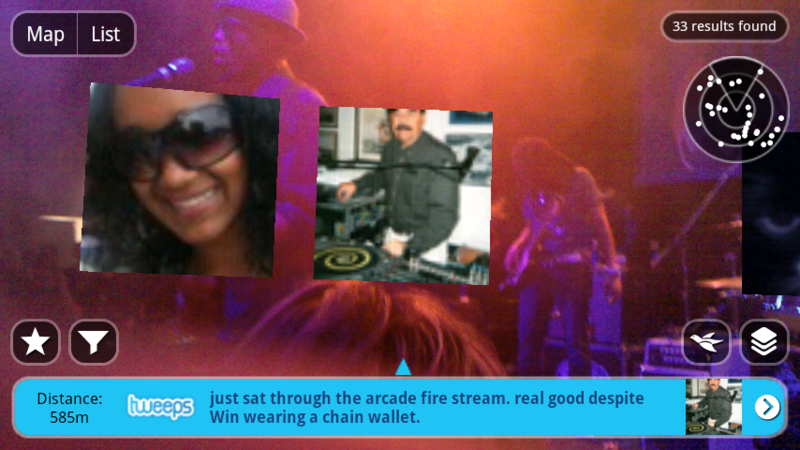 My other experiment using Layar’s Tweeps Around 3D app occurred during Perez Hilton’s One Night In Chicago Pre-Lolla bash. During B.o.B’s set I held up my Droid again and up popped a fan who was watching the Arcade Fire livestream online at Madison Square Garden from his home in an apartment just a few blocks away from where I was at the Hard Rock Hotel. And like I did during the Tom Petty experience, I tweeted directly back to the fan and asked him how the show was and told them I was looking forward to seeing the Arcade Fire at Lollapalooza on Sunday. Another great fan-to-fan connection! As I’ve mentioned throughout our mobile and Augmented Reality and concert genealogy explorations, the big challenge is to go beyond the cool and wonderful so we can get to discovering the useful and helpful. And for the most part, when it comes to connecting concert fans and sharing our live music experiences in new ways, I think this Layar Experiment was successful. And there’s many uses for this app as I’ve shown above. On the downside the app doesn’t always give you the instant results you’d hope for. Meaning that you have to play around with the radius to find the right area of fans you’d like to scope out and connect with. The other thing that I hope is improved on future updates is the user experience. Because when you’re using it live at the concert the 3D images are a bit hard to click on and if there are a lot of results that show up, it’s hard to sort through them on the screen since they’re all clumped together. And if you move left or right the images quickly go away making it hard to click on them too. Good and bad considered, I think you should try out the Layar apps and let me know what you discover, too. There’s also a few other concert 3D apps for finding concert near you. But I’ll get into those apps on a future post. I’ll continue to share more mobile experiments with you, because as mobile becomes more integrated in the concert experience, we need to find more ways to make use of these apps and see them more than just a cool new gadget to find stuff. To help get you going with your own Layar experiments, I’ve included a video that shows more details about Layar works. And I’ve also included links and info about Augmented Reality and where you can download Layar to your iPhone or Android smartphone. iPhone users can download Layar via the iPhone app store. Mashable: Augmented Reality apps for Android and iPhone. How have you used Augmented Reality, Layar or your iPhone or Android mobile phone to connect with fellow concert fans?